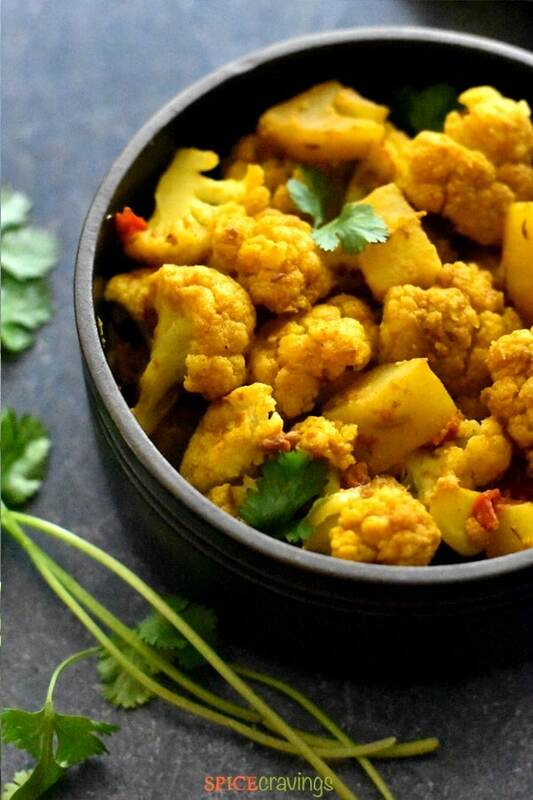 Aloo Gobi or Gobhi Aloo is a popular dry vegetarian side-dish from the northern-Indian cuisine. 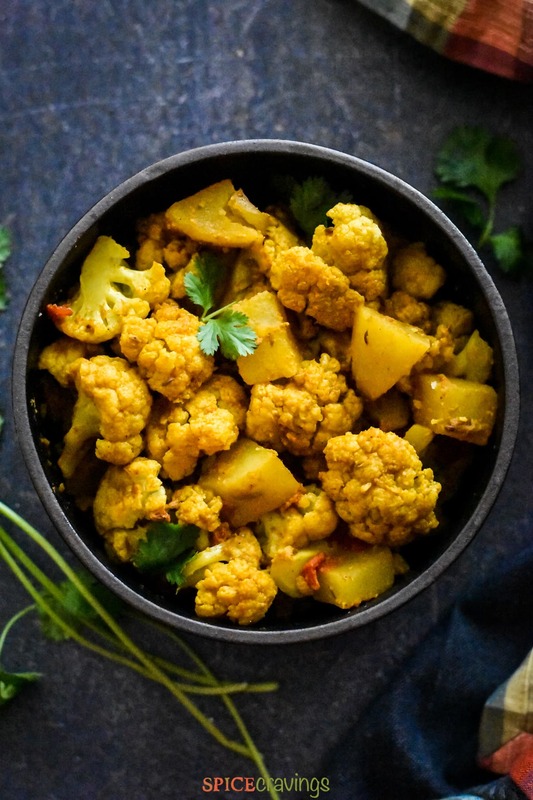 Aloo gobi is made with Aloo (potatoes), and, Gobi (cauliflower), which is cooked with aromatics like fresh ginger and garlic, chopped onions and ripe tomatoes. 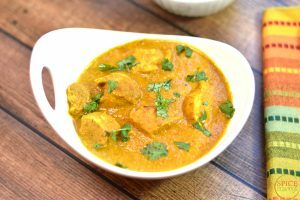 It is seasoned with toasted and ground Indian spices like cumin, coriander with a hint of garam masala, and stir-fried till it cooks through and smells heavenly. A garnish of freshly chopped cilantro adds the perfect splash of color and balance to this popular side dish. My kids love to have Aloo Gobi and Bhindi (Spiced Okra stir-fry). I make two versions of Aloo Gobi. 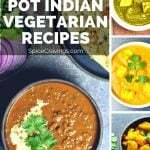 One is a light stir-fry with cumin seeds, green chilies and Indian spices, and this version, where I make a light onion-tomato gravy and cook the potatoes and cauliflower florets in it. 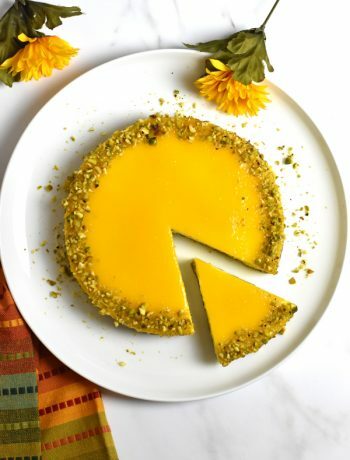 Both recipes are simple and come together in under 10 minutes. I take a heavy bottom stir-fry pan. Heat it on medium high heat for 30 seconds. Add oil, add cumin seeds and green chilies to it. When the cumin seeds begin to splutter, add cauliflower florets, potato cubes, and chopped tomato. Saute for 2-3 minutes. Add 1 teaspoon salt, 1/2 teaspoon turmeric, 1/2 teaspoon cayenne. 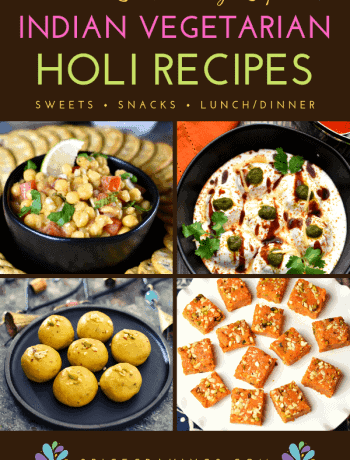 1 teaspoon coriander powder, 1/2 teaspoon roasted cumin powder and stir well. Cover the lid and cook for 4-5 minutes, or till the potatoes are cooked through. Open the lid and stir-fry for 2-3 minutes, till all the liquid has evaporated. Garnish with cilantro! 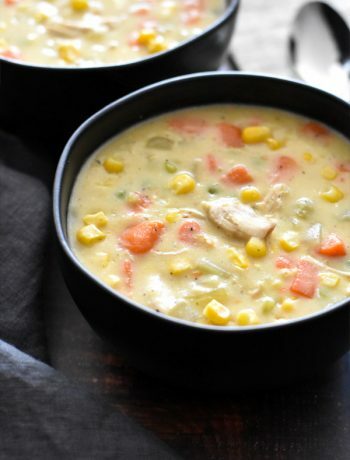 In the recipe below, I cooked this dish in my electric pressure cooker, Instant Pot. It took me sometime to figure out the right time to cook dry side dishes in it though. Due to the steam cooking style, I liked how it evenly cooked the veggies, but wasn’t a fan of the liquid I got towards the end of cooking. After a few batches of experimenting, I figured that for most vegetables 0-1 minute pressure cook/Manual was my magic number. So, you can set the pressure cooking time, based on the size of your potatoes and cauliflower florets. To learn more about the instant pot, check out my Instant Pot FAQ and Accessories blog post. 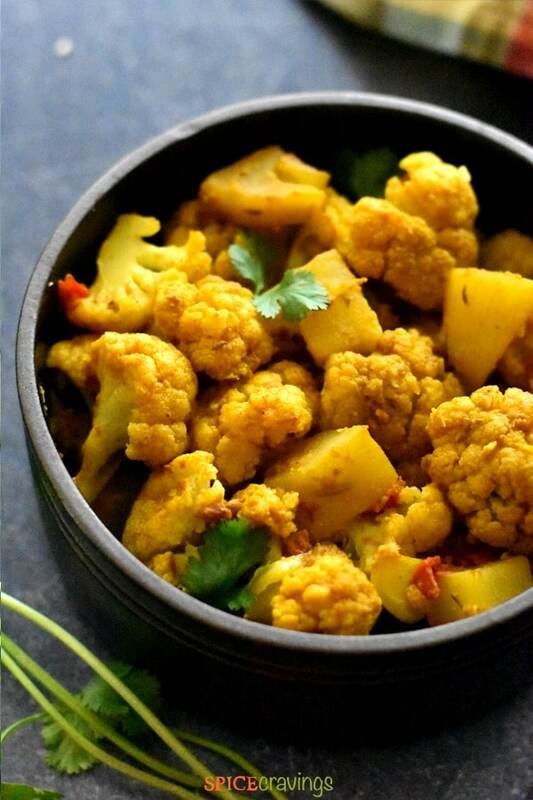 Aloo Gobi or Gobhi Aloo is a popular dry vegetarian side dish from the North-Indian cuisine. 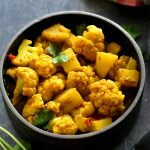 Aloo gobi is made with Aloo (potatoes) and gobi (cauliflower) cooked with fresh ginger-garlic and seasoned with warm Indian spices and traditionally stir-fried. This recipe describes both instant pot & stir fry methods. Heat Instant Pot on Saute till it displays 'Hot'. Add cumin seeds and wait for them to sizzle. Add onions, green chilies and potatoes. Saute for 1 minute. Add chopped ginger-garlic and saute for another minute. Add chopped tomato, salt and all spices. Saute for 2 minutes. Add cauliflower florets and gently stir. Press "Cancel SAUTE". Set valve to Sealing position. Cook on Manual/Pressure Cook for 0-1 minutes, depending on the size of your florets and potato. Open lid after manually releasing pressure (QR). If there is any liquid at the bottom, you can turn on SAUTE for a couple of minutes. Garnish with cilantro! Take a heavy bottom stir-fry pan. Heat it on medium high heat for 30 seconds. Add oil, add cumin seeds and green chilies to it. When the cumin seeds begin to splutter, add cauliflower florets, potato cubes, and chopped tomato. Saute for 2-3 minutes. Add the salt and all the spices and stir well. Cover the lid and cook for 4-5 minutes, or till the potatoes are cooked through. Open the lid and stir-fry for 2-3 minutes, till all the liquid has evaporated. Garnish with cilantro.